Is the website for the book still working? Can’t seem to connect with it. Thanks. All of the code samples, etc. are available there. I have searched the whole internet for your book, but it’s not available anywhere to buy it anymore…not on SAP Press, Amazon or any other website. I would really like to get a copy of the book and if it’s not printed anymore, could I buy it from you? 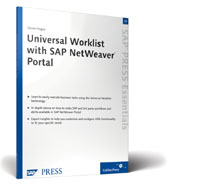 The book was written a long time ago now (over 5 years) and so it’s not really up to date any more – you might be better off buying one of the more recent SAP Workflow books from SAP Press – they will cover the same sort of material but will cover more recent versions of SAP NetWeaver.